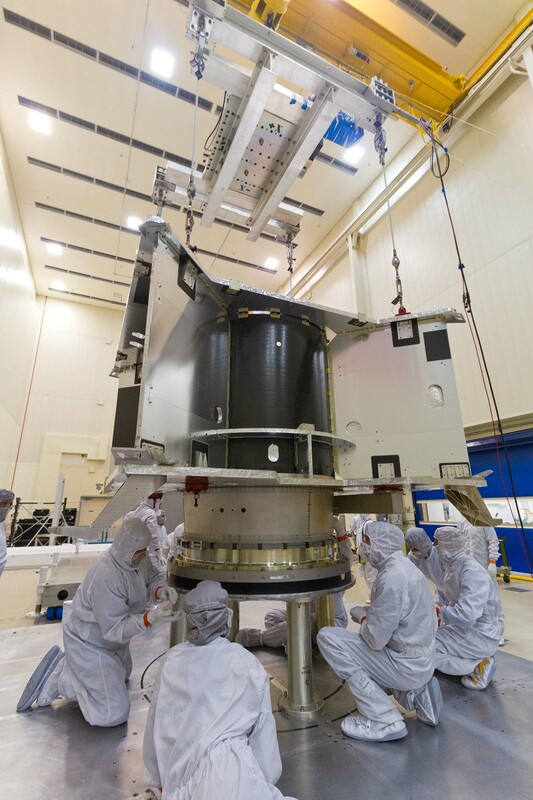 The assembly of the OSIRIS-REx spacecraft continues to make excellent progress. 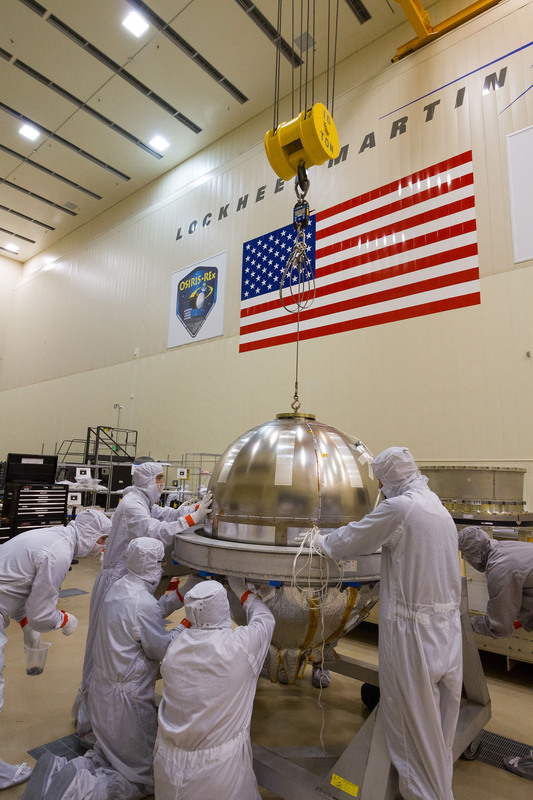 Most notably, this month Lockheed Martin installed the main propellant tank on the OSIRIS-REx spacecraft at their Space Systems Company facility near Denver, Colorado. In addition to the large tank, many of the primary propulsion components are in house and undergoing extensive testing and certification prior to being integrated onto the spacecraft. 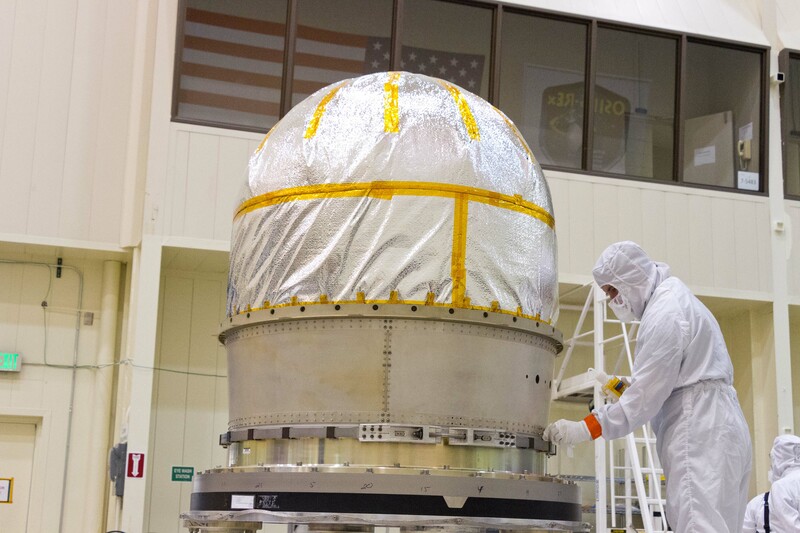 The large hydrazine propellant tank prior to integration with the core structure of the OSIRIS-REx spacecraft at a Lockheed Martin clean room near Denver. The OSIRIS-REx propulsion system is based on the system developed for the Mars Reconnaissance Orbiter (MRO) and later customized for the Juno and MAVEN missions. Our system is called a “monopropellant” system, meaning that it uses a single fuel called hydrazine (N2H4). Monopropellants are chemicals that do not require an oxidizer to release their stored chemical energy. They are stable under certain storage conditions but they can decompose rapidly to produce a lot of high-temperature gas. The OSIRIS-REx system produces thrust when the hydrazine fuel is flowed over a heated catalyst bed and decomposes. The resulting gases expand through the sonic throat of a rocket engine and accelerate out the rocket engine nozzle. The OSIRIS-REx team lifting the tank for integration onto the structure. Early in mission design, we looked at a variety of propulsion systems, including monopropellant, bipropellant, and solar-electric propulsion. Bipropellant systems, such as flown on Juno, add an oxidizing component to produce a more vigorous chemical reaction and hence more thrust. For Juno, the main propulsion system uses hydrazine as fuel and nitrogen tetroxide as an oxidizer. Solar electric propulsion systems, which are used on the Dawn and Hayabusa-2 missions, ionize the rare gas xenon and accelerate it through an electric field to gain thrust. Fortunately for us, our target asteroid Bennu has an orbit that makes it highly accessible. This feature allowed us to select the simplest, most reliable propulsion system to get to Bennu and back. The OSIRIS-REx main propulsion tank after integration onto the structure boat tail. The propulsion system is composed of the propellant tank (which holds our fuel), a helium tank (which is used to pressurize the system), pressure transducers (which help us monitor propellant and helium supply), valves, pipes, filters, and the rocket engines. As described in a previous post, the OSIRIS-REx propulsion system uses a total of 28 engines that are divided into four groups: a bank of four main-engine propulsion thrusters, six medium-thrust engines, sixteen attitude control thrusters, and two specialized low-thrust rocket engines. All engines are catalytic thrusters using the hydrazine monopropellant. The OSIRIS-REx main propulsion tank being integrated into the core spacecraft structure. 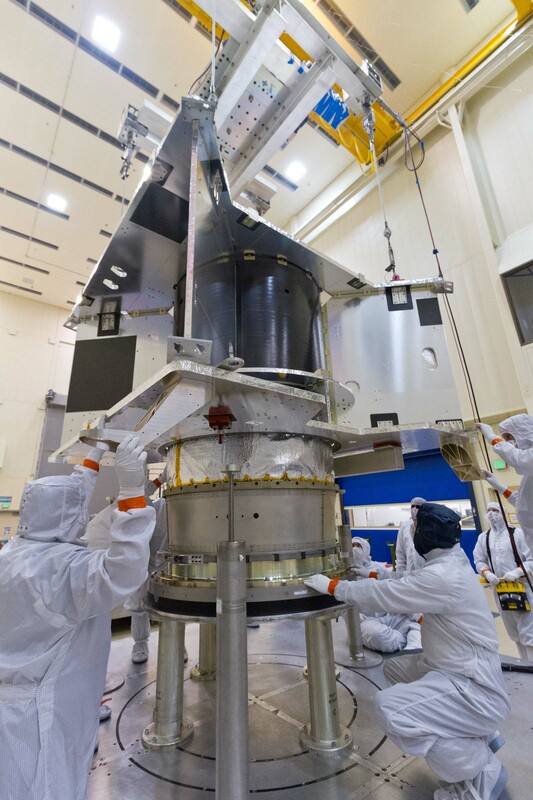 OSIRIS-REx has one main propellant fuel tank that provides high-purity hydrazine to the spacecraft thrusters as needed. This tank was custom manufactured for us by ATK Aerospace Group in Commerce, California. It was forged out of a single billet of pure titanium, which was one of the first major procurements on our program. It is 150 centimeters (58.8 inches) tall and 124 centimeters (48.9 inches) wide. It has hemispherical ends with 32 tabs for mounting to the spacecraft structure, which are identical to MAVEN and MRO designs. 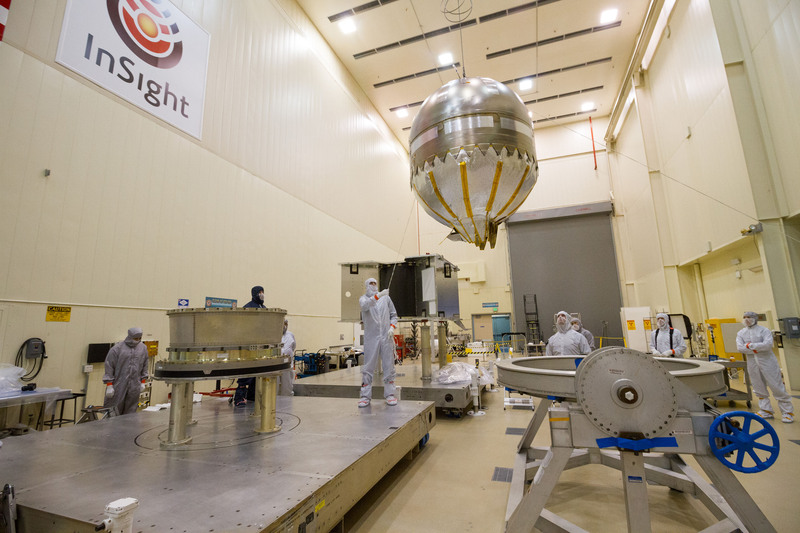 The cylinder section is identical to MRO and is shorter than MAVEN (which is 188 centimeters or 74 inches long). The tank has a volume of 1.3 cubic meters (79,400 cubic inches) and will hold over 1,100 kilograms of hydrazine propellant. Prior to sizing the tank we computed the propellant mass required for the mission using the trajectories in our Design Reference Mission, assuming a maximum spacecraft “wet mass” (the mass of the spacecraft with a fully loaded fuel tank) and continuous worst-case low-thruster performance. The OSIRIS-REx main propulsion tank insertion into the core cylinder of the spacecraft structure. The helium tank is a high-pressure (4800 psi) composite overwrapped pressure vessel that supplies helium on demand to the propellant tank. The function of the overwrap is to evenly distribute pressure loads across the entire tank. The tank is 42.4 centimeters wide (16.7 inches) and 75.2 centimeters tall (29.6 inches). It has a volume of 0.08 cubic meters (4,967 cubic inches) and holds 3.7 kg of helium. The helium tank is needed because the OSIRIS-REx propellant system operates in a pressure-regulated mode for our large main-engine burns. These include our Deep Space Maneuvers en route to Bennu, the Asteroid Approach Maneuver to slow us down for Bennu rendezvous, the Asteroid Departure Maneuver to leave Bennu, and the Earth Departure Maneuver, which occurs after capsule release and places us in heliocentric orbit for a possible extended mission. For each of our major maneuvers the helium is used to maintain constant pressure in the propulsion system. Prior to the start of one of these burns an upstream latch-valve is opened, ensuring a steady flow of hydrazine to the rocket engines. The latch valve is closed at burn completion. With these regulated burns, OSIRIS-REx achieves a higher thrust. In addition, the precise control of system pressure allows us to accurately predict burn performance and timing prior to maneuver execution. For the maneuvers using the smaller thrusters, OSIRIS-REx operates in “blow-down” mode. In these instances, the latch valve to the helium tank remains closed, and the residual pressure in the main propellant tank is used to flow hydrazine to the rocket engines. This strategy works because the burns are very short, compared to the main-engine burns, and the thrusters use a very small amount of hydrazine. Completion of the OSIRIS-REx main propellant tank integration with the spacecraft structure. 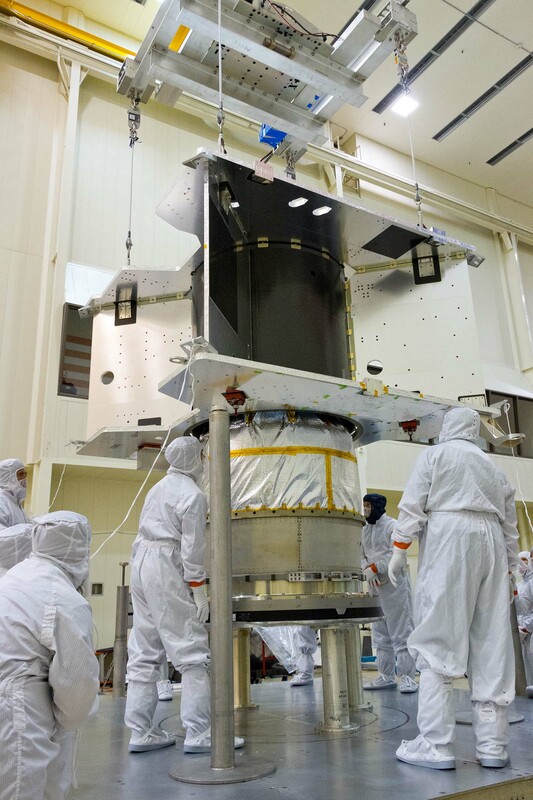 It is always exciting to see another major milestone completed in the development of OSIRIS-REx. Kevin Johnson at Lockheed Martin leads the propulsion system design and manufacture. Randy Regenold is the Propulsion Design Lead and Carey Parish is the Deputy Lead as well as the Propulsion Analysis Lead. I want to thank this team for all of their hard work to make OSIRIS-REx a success. We certainly could not get that sample back without their tireless efforts. We built two MER’s I wonder what your cost engineers would think a second OSIRIS-REx II would cost? what might be this missions extension and end of mission time frame? and does this spacecraft have a safe gappel point?